After managing a small airline based at the Burbank Airport in California, I was hired by a company called Tiger Air. They were a sister company to Flying Tiger Airline and in addition to running a Fixed Base Operation and maintenance facility at Burbank, they also had a sales and administrative office in LA along with the parent company Tiger International. This was the office I worked out of and was principally involved in sales and leasing of equipment they had purchased such as B727s, BAC 111s and B707-123Bs (ex-American Airlines). They had ordered new aircraft from Boeing but they liked to buy airline surplus like the BAC 111-400s from American. There were about 14 of those aircraft which they turned into executive aircraft and added long range fuel tanks to. The program was very successful and they wanted to do the B707-138B as a follow-up. So I was given the responsibility to find the best one out there which I did in Calgary when Pacific Western decided to sell the former VH-EBA which was then registered C-FPWV. The aircraft was flown from Calgary to Paine Field at Everett near Seattle where Tramco was commissioned to overhaul the airframe and update the engines as well as to paint it in the new Tiger Air livery. The accompanying picture shows the aircraft on the ramp at Paine Field just prior to its first test flight following the overhaul. At the time I had no idea that this was the first aircraft delivered by Boeing to Qantas. Following the overhaul, the aircraft was flown to San Antonio, Texas for the interior refurbishment by Comtran. The executive interior was designed by the late Howard Timlin who also supervised the installation. In addition to the executive interior they added a rear airstair door and an internal airstart system which gave the aircraft much more independence when operating out of smaller airports. The project was completed and preparations were made to fly it to the Paris Airshow in 1981 where hopefully we would find a rich Saudi to pay $13 million for this 'best-in-the-west' executive aircraft. Of course there was interest, but no buyers stepped up to the line. I had a contact in the Philippines who told me that the Marcos family were wanting to upgrade from the BAC111-200 they flew, so plans were made to stop at Manila after leaving Paris on the way back to Burbank. We flew the 707 to Tacloban to show it to the Marcos family. The Tacloban runway was not that long and it was one of the few times we had to use the airstart unit as well as the airstair door for access. The interaction with Imelda Marcos was quite interesting but it turned out the aircraft was just too large for them and they couldn't keep it "under wraps" very well, so they passed on it. Ferdinand was sick at the time so I never got to meet him, but Imelda was a very gracious and likeable person, in fact she invited my boss and I to join her and some friends for lunch at their summer home. Imelda grew up there as a little girl and she pointed to a house as we were driving to her summer home for lunch and said, "that is where General MacArthur lived during the war and I used to play there as a little girl". After this demonstration the aircraft was ferried back to Burbank via Honolulu and parked until sold to Airmark. Not too long after this adventure, Flying Tiger had merged with another freight carrier and Tiger International decided to sell off some of its other holdings in order to be able to upgrade the airline with new equipment. Tiger Air was one of the divisions they decided to sell off. My boss, Bob Chipperfield and I decided to open our own brokerage company. We rented a facility adjacent to one of the hangars at Burbank and we called our new business Jet Traders. We were right next door to Airmark which at the time was flying a Gulfstream 2. They needed a helicopter so I found them a used Bell Jet Ranger. 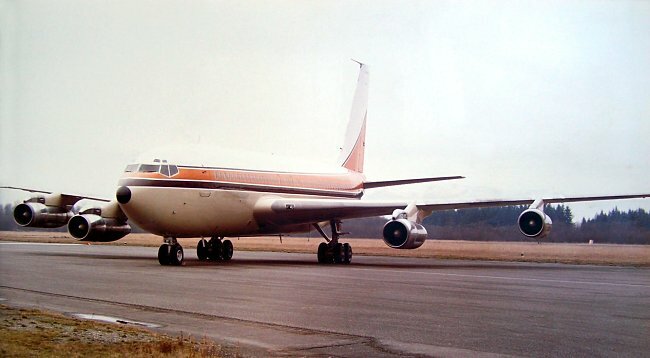 We were able to get them interested in the 707 with the concept that their wealthy owner could use it for personal flights and when not being flown for him they could lease or rent it out to others in the entertainment world. They were reasonably successful at this and at one time after taking Michael Jackson on tour he had expressed an interest in buying the aircraft for his own use but the sale did not take place. I was not involved in the other transaction which ultimately led to the Saudi government buying the aircraft for Prince Bandar who flew it as the Saudi Ambassador to the US until they replaced it with an Airbus A340 after about 10 years. I decided to leave the aircraft business and try my hand in the spec housing market in the LA area. Since then I have practically lost all touch with all my aviation friends from that time. I've only been to Australia once in my life and that was as a lowly copilot in a DC-7C which belonged to an air travel club called Voyager 1000 based in Indianapolis. I would love to visit Longreach one day to renew my acquaintance with the aircraft.